IF YOU ANCHOR IN GEORGETOWN, GREAT EXUMA, without fully exploring Elizabeth Harbour, you just might have regrets, if cruising sailors are to be believed. Elizabeth Harbour is an aquatic playground of sailors, and its secrets are tucked away inside the harbor’s coves and creeks; blue holes and reefs; sand bars and obscure channels. When the boating season peaks in The Bahamas, Elizabeth Harbour turns into a city on the sea. At sunset, the mast lights switch on when the conch horn blows. “It is like a light show on the water,” said Bahamian sailor Reginald Smith, remembering his two years living on a 43-foot Beneteau sailboat in the harbor of his native island. There are so many boats—sometimes 400 strong—and the sea is easily mistaken for a city on solid land. Reginald started sailing as a boy of five years old learning from his father, a captain, and fisherman. With an additional 69 years of boating experience weathered into his skin, he confidently insists that Elizabeth Harbour is the most spectacular anchorage in The Bahamas. Based on its popularity for sailors, there are many who would agree, citing diverse attractions and amenities and many locations to provide 360-degree wind protection. Today, Reginald is a real estate agent, community organizer and conservationist. He relishes the days when he can sit back on the balcony of his oceanfront home in Farmer’s Hill and watch what he calls “the migration”: incoming sailboats from eastern ports along North America to Exuma’s great port city. Many cruisers island-hop their way through the northern cays and then hunker down in Georgetown to socialize and enjoy island living. Reginald has a 180-degree view of the boats as they make their way to Georgetown. They emerge from the north toward Rolleville, and cruise past his house toward the most popular harbor entrance, the Conch Cay cut. The sight of white sails gliding along the horizon with a background of sky and ocean blues seamlessly blended is what Reginald looks forward to witnessing every year. Elizabeth Harbour is protected by mainland Great Exuma to the southwest and the long and narrow Stocking Island to the northeast. There are few full-service marinas in the harbor, Exuma Yacht Club is one of them, so boats anchor in clusters in the main harbor and inside one of the many coves and mooring fields like Hurricane Hole, Turtle Cove, and Red Bays. When winds kick up, you see them move with synchronicity to different corners of the harbor or tuck inside the protected, nearly landlocked coves. While protected areas abound, inside the main harbor can get windy, causing dinghy rides to be wet and rugged. Ordinarily, Great Exuma research is not likely to reveal the many things to do right in the harbor. The beach bar and restaurant Chat ’N Chill, a popular watering hole on Stocking Island, is a well-known spot for boaters and non-boaters alike. But other than that, exploring Great Exuma is often about heading in search of swimming pigs, land-based attractions or other parts of Exuma, like the Exuma Land and Sea Park in the northern part of the chain. And yet, right in Elizabeth Harbour there is a channel entrance to the Moriah Cay National Park, a 16,000-acre marine ecosystem with river-like mangrove creeks, sand dunes, bird sanctuaries, pristine beaches, and marine nurseries. Reginald says it is a mistake to think of the harbor as only being picturesque. Snorkeling buoys, maintained by the Elizabeth Harbour Conservation Partnership, mark 16 top snorkeling locations inside the harbor, including Turtle Lagoon, Mystery Cave, and Fowl Cay Reef Restoration. There are dozens of beach enclaves, some of which meld into sandbars, like Cocoplum Beach and Man-O-War Beach. The sailing itself is also a harbor attraction and not just at regatta time. Every February, winter residents participate in the George Town Cruising Regatta. 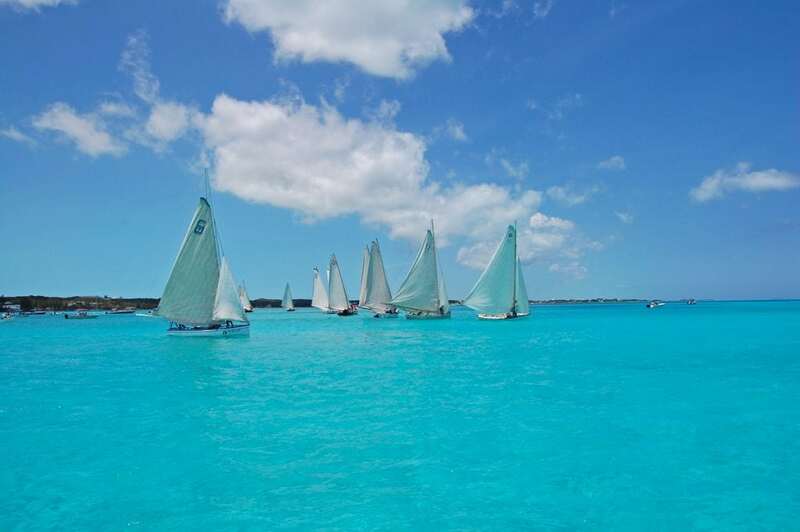 In April, there is the National Family Island Regatta, which is the largest and oldest formal regatta in The Bahamas. Sailing at night is a favorite pastime for Royston McGregor, a sailor and marine salvager living in Exuma. Once he has more than a half a moon and the waves are not high, he’ll be out in the harbor running sprints or playing in bigger waves near the harbor’s eastern entrance. As a local, he has the advantage of extensive inside knowledge. “The harbor has different sections, different depths and different wind conditions. 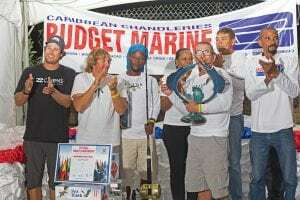 Between the mainland by February Point and Crab Cay, there is a flat stretch of shallow water that is usually calm even when it’s windy,” says McGregor. “The Exuma Sailing Club uses that to practice. That’s where I like to do sprints. Windsurfers and kitesurfers also like the area for the same purpose. It is shallow enough for kite surfers to stand at low tide, which makes it great for learners. For all that Exuma has to offer, Georgetown has hidden beauty, and it’s inside its harbor, in case you didn’t know.